Today we had a small party at home. We had invited five of our friends. Initially we had thought of making it “seafood special”. Then one of them said he does not take sea food, the other friend liked chicken compared to sea food. So finally decided to combine both. I was a bit worried about chicken as we don’t eat it, hubby eats just one piece once in a while. So finally decided to make the traditional chicken, chapathi and yellow flavored rice to go with this, one dry chicken, prawn curry, sola bangada and white rice. I was very happy when all of them liked the lunch. This chicken dish is the most popular dish at our native. 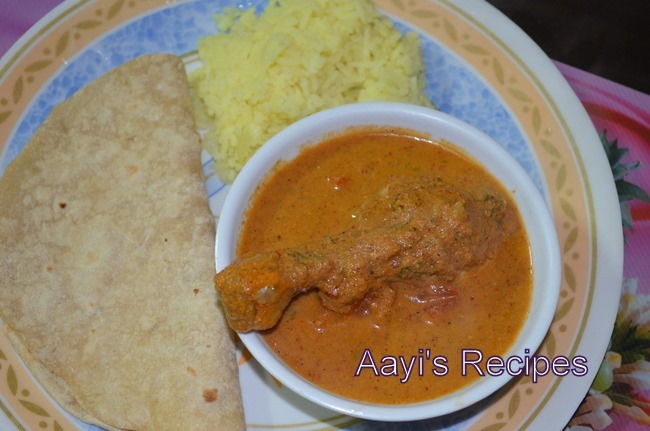 My aayi’s version was one of my favorite chicken dishes. We have a big house with garden surrounded(a typical village house), but still the aroma is so strong that even the neighbors come to know that chicken is cooking :). We absolutely loved this dish. When I prepared it earlier in India, I used to skip some of the steps in hurry to finish cooking soon and it never came out like my Aayi’s. This time I took extra care. 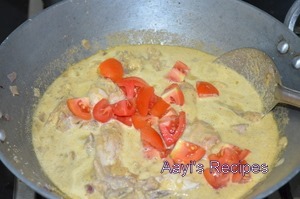 Prepared the curry yesterday night as the taste of the curry usually increases on second day. I left out few of the spices, since I did not want my apartment people to throw me out of the house :D, considering there are very few Indians in our apartment complex and I didn’t know how others would take the garam masala aroma. I recommend this gravy to all the chicken lovers at least once in life. Just forget about the calories for a moment and give it a try and I bet, you will not regret it. It usually looks more darker in color, if proper chilies like “Kashmiri chilies” or “Byadagi chilies” are used. My ‘byadagi chili’ was over, so I used normal ones. 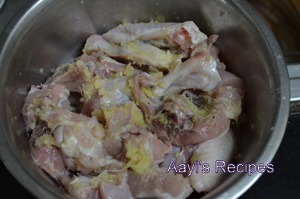 Following is the original recipe, I did not include Shahjeera and rock flower and used the spices in less quantity :). Increase or decrease the amount of spices to suit the taste. 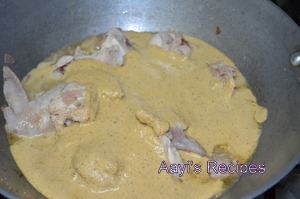 Mix ginger garlic paste with chicken and leave it for around 1-2hrs. Heat oil and fry the spices on a low flame in it taking care not to burn them. When a nice aroma comes out, add 3/4 cup onion and fry till they turn brownish. Grind this to a smooth paste and keep aside. This paste is called as ‘brown paste’. 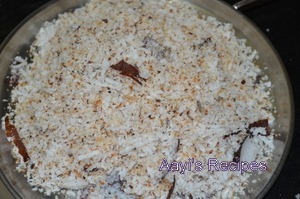 Roast the coconut(without adding oil) till it turns slightly brownish. Grind to a smooth paste. This takes a very long time to become smooth paste as roasted coconut is being ground (do not mix both pastes as these are added at different stages to the gravy). This paste is called as ‘white paste’. Heat oil and fry remaining onion till they turn slightly brownish. 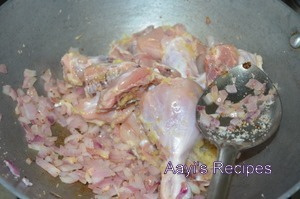 Add the marinated chicken and fry for sometime. Add 1/2 cup water(if required), close the lid and cook till chicken becomes tender. Add the ground coconut(white paste), cook for a minute. Add tomatoes chopped into big pieces and chopped coriander leaves. When the mixture starts boiling, add the brown paste and salt. Cook for another 5-6mins. Serve with chapati and yellow flavored rice, ie fried rice(gravy does not go well with white rice, so serve it with this rice). Happy to be the first one to comment . Wish i could have joined ur party… BTW who wouldn’t love ur dishes.. Your chicken gravy looks appetizing,I have been a very big fan of your cookings. My tastebuds wake up for the mangalore style cooking most of which I forget to make. I have been inspired by the food blogs and thought of creating one of my own. I have been really busy with work so never got a chance to really publish or do anything with the blog though I visit all the blogs everyday.Please do visit my blog. I prepared Phej the other day and it was great!! thanks for reminding me abt it. Hi Shilpa , I have tagged you for a Meme on my blog. Come over and check it out. 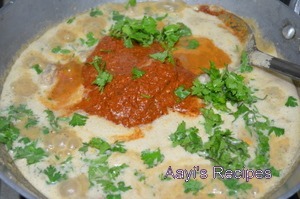 Smitha, I am happy to know you like aayisrecipes.com. I will have a look at your blog now :). Poonam, yes this is the original recipe. I usually give the original recipes and mention the tweaked parts in one or two sentences :). Anupama, I usually prevent writing about memes not related to food. I am very sorry. Thanks a lot for tagging. Sweet Hungarian Paprika is easily available in American grocery, intense red for color but very mild. Can use with the regular chilli pd. for heat…Thanks for sharing! My goal this year has been to experiment with one of my very favorite cuisines… Indian! I have really enjoyed looking over your blog the past couple of days, and I think I’m going to start out by trying this recipe. A question: do you grind the coconut with a mortar & pestle? Could I do it in a food processor or spice mill, do you think? My only hand-grinding devices are wooden, and will pick up aromas and tastes pretty easily, I think… guess I should get a new marble or stainless steel one! I’m looking forward to trying more of your recipes, too… I’m a pretty good cook, but have NO experience with Indian food other than gobbling it with great enjoyment in restaurants. Thanks! Hi Shilpa….Can made out the difference in colour, between bagde randayi and chicken (chillies offcource) Thanks for sharing this traditional version. Also thanks for mentioning that the paste needs to be added at different stages. I will definately try this next weekend. Your blog inspired my sister and me to start our own. We are konkani’s too…and my mom is from Kumta. Please have a look at our site : culinaryjourney2india.blogspot.com. We appreciate the affort and love you have for Indian food,especially North Kanara cuisine. Yes Asha, chicken is only for guests. I didn’t even taste it :). I loved the ‘byadagi’ chilies but when I started cooking, I saw my stock was over. It was a blessing because they would have got scared by the color :D.
Sudha, I wish you could come here. Yesterday was the first party I organised here in last few months. I love cooking, but there is nobody whom I can invite here :(. May be I should move to some other place soon. homewitch, you cannot grind the coconut using a pestle and mortar. Usually mixers(available in Indian stores) are used for grinding any Indian masalas. But I use the “Hamilton blendmaster” . Better to use the blenders with glass jars, since they take more load compared to plastic ones. This too takes a very long time to make a smooth paste. Aruna, in hurry, I used to grind both the masalas at a time and there was always difference in taste. 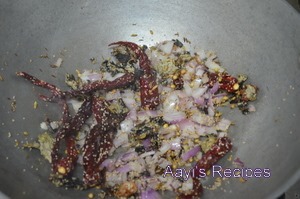 Then last time aayi mentioned specifically to add the masalas at different stages to get more aroma. So I followed the same and it made the difference :D.
Thanks for the tip! I do have a glass blender. I’m looking forward to this. Will let you know how it turns out! we have ghee rice and chicken stew for any major function. i will definitely try it out. this chicken recipe looks absolutely delicious; though i rarely eat meat, i will try it soon!!! i was wondering if you knew where in the U.S. i could find dagad phool/ rock/stone flowers? i’m afraid i don’t have it in my vast(97) collection of spices…. Thanks Shahen. I didn’t know you too make similar dish. I am finding more and more similarity between Konkani and Kerala recipes. May be because both are coastal areas with lot of coconut trees :D.
There is a picture of stone flower in the link I mentioned in Ingredients(scroll down the ‘another subcontinent’ page. You will be able to pick it easily). and it turned out soo yummy..my husband couldn’t stop having a go at the dish!! Are you the same Shilpa Kamat who studied in SV Polytechnic in the Computer Science field and passed out in 1998 ? No I was not Shilpa Kamat and I didn’t study in SV polytechnic. I tried this recipe. It came out to be very nice. I have recently started cooking, and this was a successful one. I would like to ask you, what type of Red Chillis are we supposed to use? Coz when I prepared this, it was just proper, however it would taste all the more better, if it would have been more spicy. Somehow I guess, I was little confused with the proportion of chillies. Let me also tell you that I tried this with 1/4 kg chicken. Could you also tell me, can we use green chillies instead of Red chillies? If yes, let me know the proportion. Let me infor you that, there is one addition now in your and your web site’s fan list. Sharon, if you felt it was not very spicy, increase the chilies. You can use either “byadagi chilies(Karnataka)” or “Kashmiri chilies”. The first variety is usually available in Indian stores. Since the other spices give it a very spicy taste, I have mentioned less chilies. You can increase them to suit your taste. 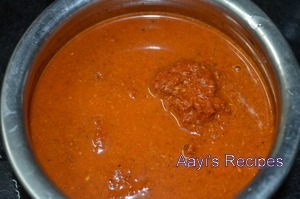 This gravy is always prepared with red chilies, so I don’t know how it will taste with green chilies. I advice you to make the curry as I have mentioned, once it is ready, taste it a little and if you feel it is not spicy enough, add some chili powder and cook for another 2-3mins. Was wondering if u could give in a recipe using “minced” chicken?? Wish u happy diwali. Today, coincidently i came across your site, i was excited after surfing it. Ayi’s cooking tips was great. I born and brought up in bombay. Now i am in south africa. Today i will try konkani sambar. I am a konkan too. I hail from Goa. 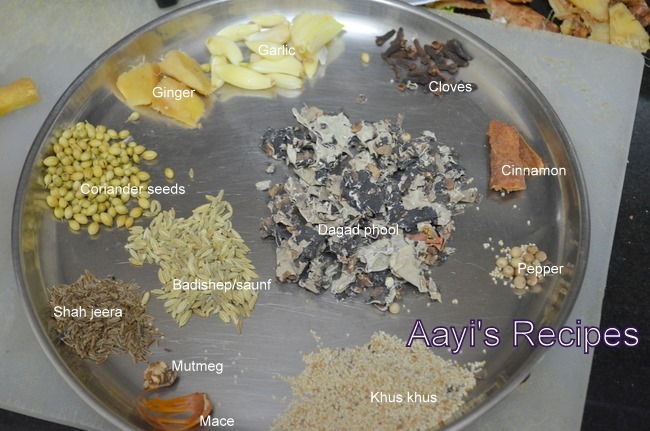 I have browsed through “Aayi’s Recipes” several times and find it so very interesting. It is my favorite site. It was brilliant and the chicken curry was simply great. and that turned out very good too. I think I will be busy in the kitchen nowadays 🙂 because I intend trying out as many recipes as I can. I am sure they are all Great and I love the way you include pictures with the narration. Keep up the good work. Nice recipe…my mom is from karwar.now she is not there. but i missed my mom a lot by reading ur recipe. 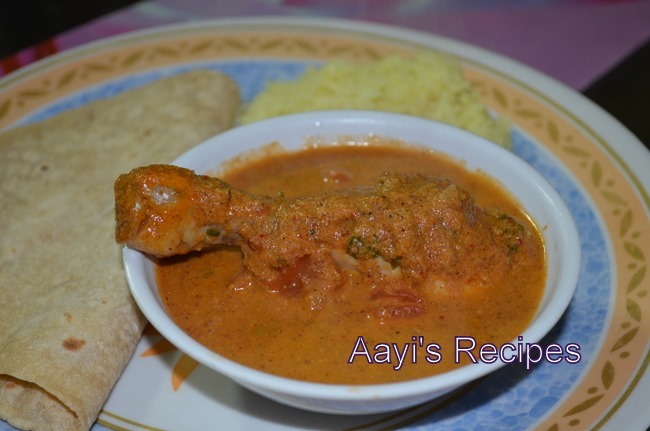 I am from Goa.Thanks for sharing this recipe .This is the first recipe I have tried from your website and it turned out yummy.I will now regularly try your recipes .This reminded me of my mom’s goan chicken. 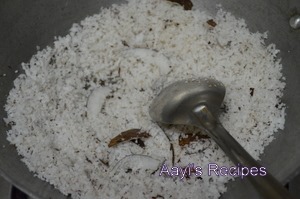 Here’s an easy way of grinding coconut, fresh, dessicated or roasted. Put the coconut in the small dry grinder, do NOT put water, give it a spin for about 30 seconds. Open the grinder; you may have to scrape the sides, get all the coconut together again and grind it for another 30 seconds or so. Continue this way till you get the desired effect. This doesn’t take very long. You will be amazed at how fine it gets. In the case of dessicated coconut, if you grind it for sometime, the oil comes out. I’m a goan and has been visiting your site since long but never wrote to you. You have a wonderful website. I too love cooking. I need to know the recipe from your mother for the chana and sprouted mung ross we popularly call in Goa, which is a must among the hindus during the Ganesh festival. I miss a lot my neighbourhood Aayi who passed away and we used to wait for the ganesh to come in childhood specially for the ross. Shilpa: Never heard of ross (are u referring to rosu???) I have mooga rangayi and mooga gati on the site which are also Ganesh festival specials. Have a look at them under side dishes. i bumped on to ur site while searching for a simple n easy ‘kori roti chiken’ recipe n was really excited on realizing u had the simplest recipe/ preparation for this dish. i m a novice at cooking n honestly m not too fond of it hence get really stressed out in tat area…… ur recipes r very simple n easy…. THANK YOU! u r god sent for ppl like me :o). Shilpa: If I have not written cup in front of it, that means it is the quantity. In the above case you mentioned, it is 1 tomato. Where do I get Dagad phool(stone flower) in NewYork? Do u use nagkesar and tirphul in ur konkani cooking? 1. when you say coconut, is this ole khobre or sukha nariyal? 2. Adrak Lasun pste: what is the ratio of adrak to lasun? Loved this dish. Since I do not have a good grinder, the paste was coarse and the final product does not look like yours. But it sure did taste amazing! I enjoyed this dish 🙂 I just don’t know where to find dagad phool in Boston. But without it, the recipe was delicious. Japatri(mace or the skin of nutmeg).My mom also does not know.Where can i find them.Will i get in food world?.wat do ask in the shop.I live in chennai. Looks yummy, will ask my mom to make this for me!! I never cooked chicken, as the husband and mayi don’t eat it. Thank you…I am trying this today..My wife is out of station…and our dog is on hunger strike..as almost 15 days now.. there was non veg at home…Hope I will get aayi made chicken flavour.. Thanks a lot…But donot know I am not getting the flavour what mammy makes. In my next visit to my native (honavar) I will watch and report how my mummy makes this..
Wen u say whole chicken how much kilo is it. I am planning to make it tomorrow. If u can tel it kilo i can adjust the spice according to that. Its for a family of 4. I can say approximately 1 kilo. i am hard non-veg. i like to prepared by myself it. Made this for lunch.Super Thank you.Wondering if we can use the same ing for mutton? Can i use ready made garam masala instead of making it? will it taste good? I managed to get ingredients other then dagad phul and mace. Can i make it without these two things? Will the taste change ? Shilpa, the recipe seems yummy. Can you suggest if it would make sense to use Homade Coconut Milk as against fresh coconut. I fear if the coconut is not ground well into a fine paste, it may separate in the gravy and may spoil the show. What do you think? Yes, I use frozen coconut too. Hi Shilpa..Made this recipe today and it turned out really yummy..everyone at home loved it ..Thankx for sharing the recipe..I skipped the daggad phool but still it turned out yummy..Gonna make it again.Do keep sharing ur moms recipes.